New York, NY – September 20, 2016 – Vela, a global industry leader in high performance trading and market data technology, is pleased to announce that its fully managed low-latency market data platform is now live at TMX, Canada’s largest integrated multi-asset class exchange group. Vela’s managed services platform has enabled TMX to launch new services for the protected markets to comply with Canadian regulatory requirements. 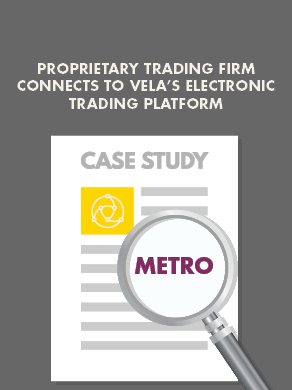 Vela’s platform powers the TMX Information Processor (TMX IP), ensuring clients receive high quality and reliable, real-time market data. TMX will also leverage Vela’s distribution component to publish data into the STAMP format that is used in other products. The TMX IP provides a central source of consolidated Canadian equity market data that meets standards approved by regulators. The TMX IP products include the Consolidated Data Feed (CDF™), Canadian Best Bid and Offer (CBBO®), Canadian Best Bid and Offer for Protected only markets (CBBOP™), Consolidated Last Sale (CLS™) and a Consolidated Depth of Book Feed (CDB™). TMX clients, with regulator driven best-price obligations, can benefit from a cost effective alternative to direct feeds and aggregation of Canadian exchanges and ATS’s market content. Vela’s managed market data platform provides end-to-end operational support for its unique blend of low-latency feed handlers and products to consolidate quotes and trades from different market centers. The platform is fully managed by Vela’s 24x7, follow the sun, team allowing TMX to focus on new growth into other asset classes and new data products.